Croatia’s jewel, Dubrovnik is absolutely magical! Its Old Town is truly stunning and an absolute must-see – it’s easy to spend a couple of days exploring, walking the city walls, and visiting all the sights in and around it. Dubrovnik does tend to get very crowded during the summer months – especially as it receives so many cruise ship passengers – so a citybreak trip outside the busiest of months is ideal. 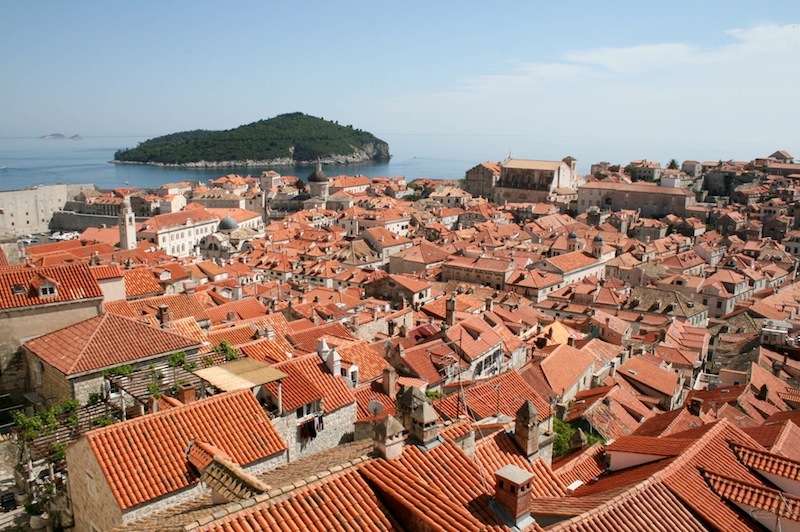 Alternatively, putting up with the crowds may well be worth it to see Dubrovnik! There’s a very wide variety of accommodation in Dubrovnik – from hostels, to private rooms to 5* luxury hotels. Some hotels have their own private beaches or swimming areas, whilst there are also public city beaches such as Banje if you fancy combining your sightseeing with some sea ‘n’ sun relaxation. 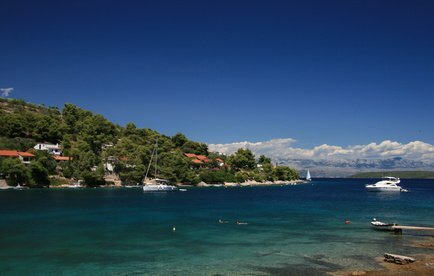 There’s also plenty of opportunity for day trips to nearby islands – such as small island of Lokrum (which is very close), the Elafiti islands or Mljet, and other nearby resorts such as Cavtat. For the more adventurous amongst you, you can also take day-trips to the neighbouring countries ofMontenegro and Bosnia & Hercegovina. The Plitvice Lakes National Park is another amazing wonder within Croatia. With sixteen interconnecting waterfalls, and beautiful flora and fauna, visiting the Park is quite a unique experience. It’s possible to stay right by the park itself, or just outside, so you can easily spend a good couple of days exploring its various trails. There’s also a boat tour within the park, as well as a shuttle bus that runs regularly, so you don’t have to spend all your time hiking around. Plitvice is a little off the beaten track in terms of where most visitors to Croatia go to (it is inland north of Zadar, and a good few hours southwest of Zagreb), but it’s definitely worth trying to incorporate it into your trip if you can. 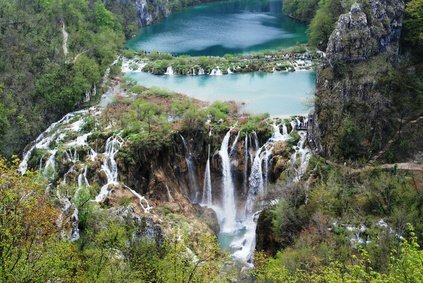 If you do fancy visiting the Plitvice Lakes, we’d recommend flying into one of these two places, and then using Plitvice as a stop-off point either on your way to or from the coast. Okay, so we’re cheating a little bit by naming an entire region, but as so many of Istria‘s resorts are perennially popular (it’s easy to see why) we thought we would include the whole lot as one destination. The region was totally unscathed by the war so was still visited even during that time, and just after was quick to promote its tourist offerings once more. With good transport connections including flights to Pula or to nearby Italy, it is easy to reach the area. 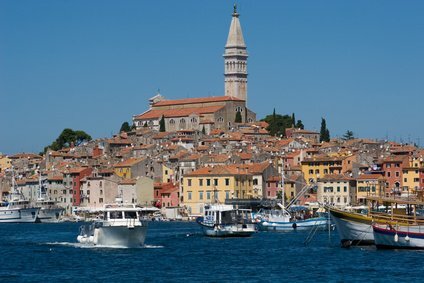 Most Europeans drive down from their home country, but there are also bus connections to Italy as well (from Trieste) and a summer catamaran service that connects several Istrian ports toVenice – a quick and easy easy of combining that fantastic holiday destination with this one in Croatia. Porec is one of the top resorts – there’s a good selection of resort type hotels there – though our personal favourite is the charming Rovinj (shown above) and its wonderful harbour. Both of these have a number of sights for you history buffs, but don’t forget to visit the Pula to view the amazingly well-preserved Roman amphitheatre. However, Istria’s (relatively!) undiscovered secrets are its wonderful inland, hilltop towns and villages. These include Motovun, which is gaining recognition of its annual film festival, and Buzet, which is famed for its truffle festival every autumn. And not forgetting Hum – (unofficially) considered to be the world’s smallest town, with only 22 inhabitants. Zagreb has good flight and other connections to the UK and Europe, so it’s easy to reach – and it’s only around 2 hours from the UK, which makes it a very acceptable place for a city break. 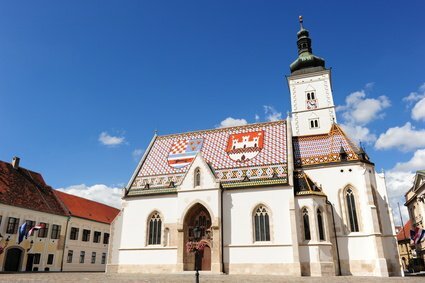 Alternatively, Zagreb is also very well connected to the rest of Croatia by train, bus and air, so it’s also a great place to commence your holiday in Croatia – spend a couple of nights here, and then make your way to the coast. Spend your daytime in Zagreb sightseeing – there’s very pleasant walks to be had in both the Upper Town (home to the Cathedral, St Marks’s Church, Kamenita vrata, Lotrscak Tower and more) and Lower Town, not forgetting the ubitiquous stroll through the main square, Trg bana Jelacica. There’s also plenty of galleries and museums and, befitting a capital, there’ll be a handful of exhibitions and events taking place at any one time. When all this takes it toll, join in Zagreb’s cafe society for a cup of strong coffee – or a refreshing beer – at one of the numerous cafes on the main square or on Tkalciceva ulica in the Upper Town. Finally, why not sample the nightlife? There’s a number of bars and clubs in the city to give you a taste of clubbing, Zagreb-style. Another great thing about Zagreb is that it has plenty of accommodation – from budget hostels to 5* hotels – so you’ll be sure to find something that fits the bill, whatever your budget. 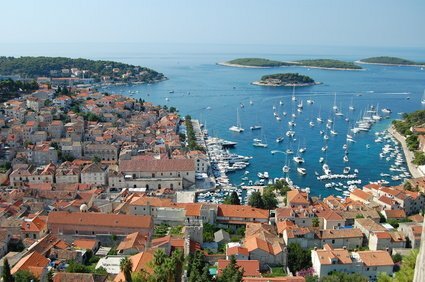 Hvar is very well-known for its wonderful weather, with the highest annual average hours of sun in the whole of Croatia. The island is also famous for its lavender growing in amongst its beautiful landscape, so you can imagine a pretty heady combination of great weather and beautiful and aromatic surroundings as you relax on the island. There’s a number of stylish hotels located in Hvar Town, and a handful of sights (although not too many – avid sightseers should really go elsewhere), whilst its wonderful harbour is a very pleasant place to while away your time in early evening, people- and yacht-watching. There’s a few beaches close to Hvar Town, though our recommendation is to head to the nearby small group of islands, the Pakleni islands (local boats will take you there) for a relaxing day out. The Makarska Riviera is often a top tip for families looking for a peaceful and relaxing holiday. There’s a number of resorts on the Riviera, varying in size, and its combination of well-priced hotels, reasonable local amenities (although no night-long clubs!) and good pebble beaches means you’ll often find the parent-and-kid brigade here. There’s not a whole lot of sightseeing to be done, so if you’re after a sea and sun holiday with the little ones, the Riviera is a good choice. The largest resort is Makarska itself, others include the more serene and smaller Brela and the very popular Baska Voda. Makarska is about 1 hour 15 minutes away from Split so it and its surrounding resorts are easy to reach. There’s also a ferry to the island ofBrac for those that want to try something a little different for a day or two. Finally, you can’t escape to notice Mount Biokovo behind the Riviera – for the slightly more adventurous, there’s plenty of hiking opportunities. For those that like to take it a bit easier – but still like their views (which can stretch across to Italy on clear days) – a road takes you up most of the way. 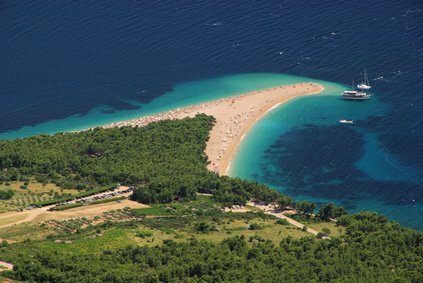 One of Brac‘s – and indeed, Croatia’s – most famous images is that of Zlatni Rat beach (pictured above). A white shingle beach next to pine trees, it changes shape ever-so-slightly as the tides and winds change. It’s a very popular place during summer, as is much of the rest of Brac; as Croatia’s third largest island with delights such as the above and its proximity to theSplit on the mainland (it’s the closest large island), it’s easy to see why. The main resorts on Brac are Bol, Supetar and Milna, and all have a mix of beaches and some resort life. Like the Makarska Riviera, Brac is popular with families and for those looking for a relaxing seaside holiday, which is shown in the pretty decent range of accommodation in all the main towns on the island. There’s not too much in the way of sightseeing or culture, and there’s not much to explore inland (although you can head to the island’s highest point, Vidova gora; at 780 metres high, there’s some pretty good views). There are daily ferries to Milna, Bol and Supetar from Split. 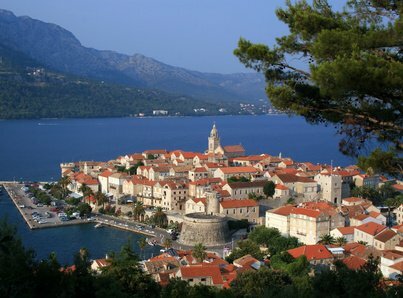 Korcula Town is often described as a mini-Dubrovnik (so that’s one big draw!) but it’s a wonderful place to visit in its own right. With its own Old Town that’s compact (it doesn’t take long to walk around the whole thing) but there’s still plenty of sights to keep you occupied. There’s a number of beaches close to Korcula Town itself, though many describe the island of Korcula’s quiet coves and bays as a must-do if you’re visiting the island. Korcula Town is connected to the mainland by ferry (the ferry departs nearby Domince to Orebic on the Peljesac Peninsula) so it’s relatively easy to explore this part of Dalmatia. July and August also see a catamaran connecting Korcula Town to the wonderful island of Mljet, and Dubrovnik – so you can compare the mini-Dubrovnik to the real thing. The island of Vis is different to many of its neighbours. The most westerly of the larger Croatian islands, its history that really sets it apart – used as a naval base during the years of Yugoslavia, the island was completely shut off to foreigners until 1989. As such, the island has developed its tourism differently to the other Croatian islands. It’s the place to go to if you want to sample Croatia and its island life but without all the crowds, and where those in the know head to – get there before everyone else does! 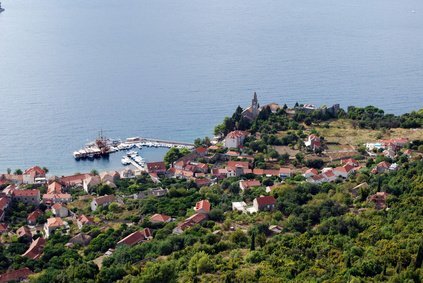 There’s a handful of sights in both Vis Town and the other larger settlement on the island, Komiza. Both only have a few accommodation options, so neither place gets too crowded. If you have your own car (you can also rent scooters on Vis), the island really does lend itself to exploring – set off down the roads and see where they take you. One of the most popular sights in the area is the beautiful Blue Cave on the uninhabited nearby island of Bisevo. The cave sees sunlight drifting into it that catches the sea waters, creating a stunning, shimmering experience. Boat trips are available from both Vis and Komiza. There’s a direct ferry from Split to Vis, so it’s easily reachable; there’s also a route that goes to the neighbouring island of Hvar (which stops at Hvar Town – number 5 on our list) if you’d like to explore some of the other nearby islands. We don’t really want to give the game away about the Elafiti islands –Kolocep, Lopud and Sipan – but we’d be hard pressed to have a list of the top ten destinations in Croatia without including them. Located very close to Dubrovnik, these three small islands are wonderfully peaceful with no cars on most of the islands and, in fact, populations of only a few hundred in any one settlement. They are also only just touched by tourism – though there is at least one hotel on each island and some private accommodation, but that’s really about it for accommodation choice. There’s also not too many sights to traipse around, so you’re not going to get too many day-trippers wandering through the islands – although you’ll also not have to exhaust yourself with sightseeing. If you’re in or near Dubrovnik, the Elafiti islands are the perfect destination for getting away from it all for a bit, especially so as a nice balance to the aforementioned tourist-heavy city. Sipan is the largest of the three islands though it is in fact the least developed – which may be a plus for some travellers.